The rarity of the saola gives it mythical status in some parts of Asia, with some referring to it as Asia's "unicorn." Vietnamese officials are setting up a nature reserve to protect one of the world's rarest animals, the saola, sometimes known as Asia's "unicorn." 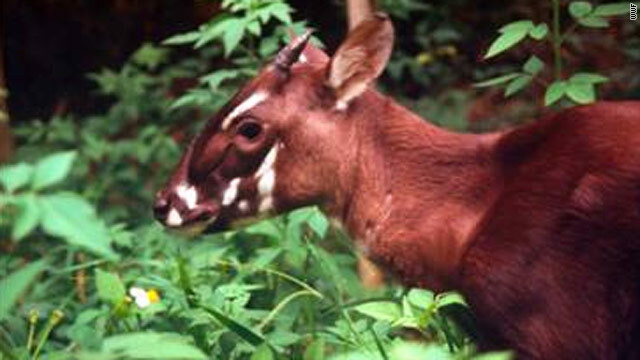 A few hundred are believed to remain in the wild, inhabiting the Annamite Mountains along the border of Vietnam and Laos in Southeast Asia, according to the World Wildlife Fund, which, along with the Quang Nam Provincial Forest Protection Department, announced the establishment of the Saola Nature Reserve in the province. None of the animals are in captivity, and the few that have been caught have survived only a short time, including one that villagers in Laos captured last year. The saola is about 3 feet tall, weighs as much as 220 pounds and has two closely spaced horns that can reach almost 20 inches in length, according to the WWF. WWF forest guards and rangers will patrol the area, looking for snares set for wild boar and barking deer that also could trap the saola. The animals also have been hunted for their horns, which are prized as trophies, according to the WWF. The saola was first discovered in 1992, and the one captured in Laos last year was the first confirmed sighting of the animal since 1999, according to the International Union for Conservation of Nature. The rarity of the saola gives it mythical status in some circles, according to that organization. Although the saola has two horns, it may be the basis of the Chinese unicorn, the qilin, the group says. It is unknown if the saola ever existed in China, however. I im not mistaken, sciam.com did a thing on this a while back. They have a pic of one of these guys that confrim it has one horn in the middle of its head. The scientific debate is weather it's one horn on that particular saola was the result of injury or genetic mutaion. It's not a unicorn, it's a two-nicorn...get it 2-ni-corn! Ha-Ha! Thank you very much. I'm here all week! Please be sure to take care of your waiters, waitresses, and bartenders! Thank you, good night. Drive safe. That animal is toast literaly to the vietkong as they eat anything that will boil in a hot pot. Two-nicorn. Lol. Best one yet! @Philip: What does banasy...whatever. LMAO mean? Hey lordbobo, I have a nice comfy set of railroad tracks you can sleep on. The engineer could be helped quickly with your writings then he would be proud! They are beautiful animals. Hopefully they will be able to save them. Thanks for sharing your blog! The WWF made this announcment? Since when do professional wrestlers care about animals? They need to send Tom Cruise there to protect these "unicorns" just like he did as Jack in the movie Legend. Just leave Mia Sara, aka Lili behind though. A horse! Yay!! I love these. I have been hanvig fun taking pictures with those little green maple buds lately. They are so pretty.